Comments From the Artist: I have been a lifelong artist at heart. 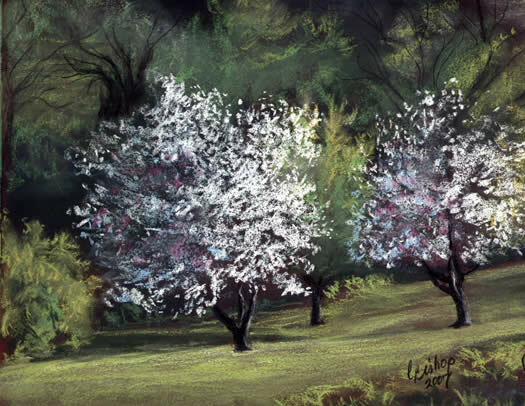 Yet, it’s only in the past couple of years, since I am semi-retired, then finally retired, that I’ve found time to really pursue my passion – depicting the earth’s riches, primarily in floral paintings and landscapes. Watercolor and pastels have been my preferred media in the past several years, and both give me a great, yet rewarding, challenge. I welcome all thoughts and comments, as well as suggestions as to how I might improve my work. I grew up in Monroe, Wisconsin, and graduated from the University of Wisconsin-Madison. A former magazine editor and writer, I lived most of my adult life in New York City and Aspen, Colorado, before returning to my roots in Wisconsin, where I was a public relations counselor in Madison until my retirement in September 2007. Wonderful colors, I’m curious, is this a place you know? It seems like a thoughtful place. The trees in the back look ominous, while the ones in front are so light and cheerful. It makes me stop and think, Its great. This is beautiful – especially the trees in white. Wish I could take lessons to learn how – do you have a video? I just love it – truly – I love the swirly feel of the trees in the background, you’ve captured atmosphere, the right amount of lights and darks and I Iove the trees in the foreground. A most delightful picture. I’ve just taken pastels up this last year and am loving the hands on feel rather than the distance of a brush. Very interesting. i just love the contrast of the trees in front and the ones in back. I really like the colors on the two front trees. How WONDERFUL that you can paint and CREATE in your retirement! This painting captures a magical sense of low angle lighting, that which is viewed in the late afternoon or early morning light. You have done quite well creating this “magic” in your painting. I have a few comments to make about the SHAPES you have used. In the background behind the left white blossomed tree is a black tree shape rising up and out of that tree. That black shape seems very prominent because it is next to the white value of the tree. The attention is drawn to that area because of the detail in the shape of the branches moving in various directions. By having some of the green in that area interrupt or take bites out of that tree shape, it would be less noticeable. Also above the right flowering tree is a dark directional shape leading us out of your painting. The reason this is prominent is because it because it is next to that light green area. By playing those two dark shapes down and having them integrated more into the green background, the focus is more on those two lovely trees that you have painted. The lower right hand corner has a prominent triangular shape that could be changed to connect with the foreground. That straight dark value right next to the right side of your painting could be eliminated to solve this. By squinting you can see these prominent dark shapes. You really are ON YOUR WAY! Remember to really look at those SHAPES to see how they all work together in your painting. Concentrate on SHAPES rather than on things or subject matter! Beautiful work! Keep creating! Thanks for sharing! I can see why you would be drawn to paint this scene…. lovely work. I admire your expertise with pastels especially as I have a long ways to go with them. Beautifully done I feel and I am learning from it. Thank you all for your lovely comments and constructive criticism. I truly appreciate your taking the time to comment! Thank you all for your lovely comments and constructive criticism. I truly appreciate your taking the time to look and comment! Yes, this is a place I know and love … our backyard at our former home near Monroe, Wis.
Carolyn–how wonderful to find you in the art world (where I, too, have become a watercolor artist in retirement! Love this beautiful painting. Have never forgotten working with you at Scholastic and our various get together s in Denver and Aspen.